Travel is almost a way of life for Dale Pepper. When he left the service, Dale and his friends drove home from where they were stationed in Panama – over two thousand miles – often on backroads and through rough terrain. Most recently he spent nearly a month exploring the islands of Hawaii. When at home in Clermont County, Dale isn’t indoors much. He’s a fan of the links, playing golf in good weather or under slightly less than perfect conditions. Hiking keeps him in good condition. Dale hikes trails both in this area and when he’s on the road. At Music Hall, Dale does “double duty” – volunteering for SPMH as well as the Cincinnati Symphony Orchestra. 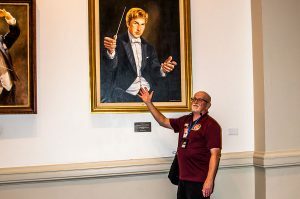 In addition to other duties, Dale enjoys being a “concert concierge” to help people navigate through the newly-renovated Music Hall and answer their questions about the hall and the CSO. In his 6 years volunteering with the symphony, he prefers coordinating and meeting buses as students arrive for CSO youth concerts. Dale gets on each bus to explain to students the procedure for getting to their seats. One time he entered a bus and got a surprise: the driver who greeted him was his next-door neighbor. It was though his volunteer gig with the CSO that Dale heard about SPMH needing volunteers. He signed up to become a Program Guide in July 2017, to conduct tours of Music Hall. He volunteers because he enjoys the challenges of learning about the structure’s history and sharing those details with the guests on his tours.